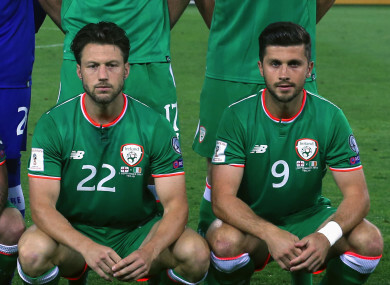 Ireland's Harry Arter and Shane Long. MANAGER MARTIN O’NEILL has finalised a squad of 26 players for the Republic of Ireland’s games against Wales and Poland. O’Neill’s side will open their Uefa Nations League campaign in Cardiff on Thursday evening, before travelling to Wroclaw for a friendly next Monday. Five players have been trimmed from the provisional squad O’Neill announced for the double header of fixtures last week. Goalkeeper Kieran O’Hara, who’s currently on loan at Macclesfield Town from Manchester United, will link up with the Ireland U21 squad for their European Championship qualifiers against Kosovo and Germany. Defenders Greg Cunningham (Cardiff City) and Darragh Lenihan (Blackburn Rovers) have also been omitted. An injury to Southampton striker Shane Long has given O’Neill another headache up front, where the Ireland boss was already dealing with the unavailability of Sean Maguire and Scott Hogan. Long picked up a foot injury in his club’s Premier League win over Crystal Palace on Saturday. But perhaps the most notable absentee is Harry Arter. O’Neill confirmed last week that the Bournemouth midfielder, who’s currently on loan at Cardiff City, had a verbal altercation with assistant manager Roy Keane when the squad last assembled in June. O’Neill is likely to address Arter’s omission when he speaks to the media after Ireland’s training session in Abbotstown this morning. The 28-year-old played all 90 minutes of Cardiff’s 2-3 defeat to Arsenal yesterday. Email “Arter and Long out as O'Neill trims Ireland squad for Wales and Poland”. Feedback on “Arter and Long out as O'Neill trims Ireland squad for Wales and Poland”.